A while back, we went to the AMD/Microsoft TechTour which offered us a Tour Bundle at a discount over purchasing through distribution. We decided to take a risk and purchase the bundle. This is the first time in over five (5) years that we have purchased anything AMD! Why? Because, we were burned so badly by a number of AMD based systems back then that we never turned back. We had to fight with the motherboards to work with any add-in cards like network or video for example. Or, we had to fight to get the drivers to work properly or the system to run stable at all. There were a number of times we were replacing components or motherboards to get things to play together nicely. Any so-called cost savings was obliterated by the time fighting with the systems. And here we are, with the processor, motherboard, some Kingston RAM, a couple of 320 GB Seagates setup in a RAID 1 array and having just finished installing Windows Vista Ultimate. All in all, the install went smoothly. The one glitch we ran into was getting Vista to recognize the on board ATI X1250 video subsystem. Vista refused to. After fighting with it for about half an hour, we extracted the driver ZIP file, and went into the Device Manager and forced the driver to update via the Update Drivers button on the Standard VGA driver. After a reboot the Standard VGA was still there, though the display setting was reset to 640 x 480. So, tried one more reboot and it worked. We now had Vista recognizing the video as an ATI X1250. Um, Intel's "chipset" drivers tend to be something like 2-3 MB. So, the only logical conclusion with a 149 MB download, is that Asus packages both the chipset and video drivers together. That is a pretty chunky download by the way. A whole whopping 40 MB. So, take 3 MB for Intel's chipset drivers and 40 MB for ATI's Catalyst drivers, and that leaves 100 MB+ of what exactly? Not too sure on that. The first run at the Windows System Assessment Tool failed. That was after the first reboot post ATI driver install. The Windows System Assessment Tool ran fine after the second reboot. 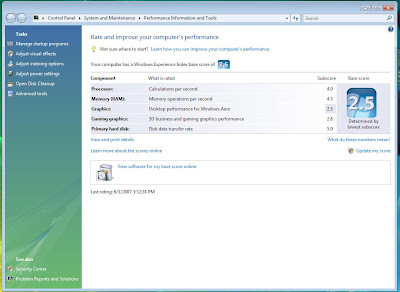 Desktop performance for Windows Aero scored a 2.5 and the 3D business and gaming graphics performance scored a 2.8. So, how does the on board ATI X1250 stack up to Intel's on board GMA 3000 series video chipset? Not really that well I am afraid. the on board GMA 3000 series graphics ran a 3.9 score for Vista Aero and a 3.7 score for 3D Graphics. Intel's 945GM chipset in a Toshiba Portégé M500 had a Desktop performance for Windows Aero score of 2.0 while the 3D business and gaming graphics performance scored 2.8. For most users that use the Internet, e-mail, and perhaps Microsoft Office this performance level would be okay. I think that the occasional gamer may be a bit disappointed in the ATI X1250 performance and go out and pick up at least an ATI X1600 or above to get better performance. This particular box is going to be our test desktop mule for our SBS Cougar beta testing. So, it is going to get a lot of use, as well as tear downs. Hopefully it is up to the task.